For everyone that didn’t know: I am a huge fan of Sondheim’s work! I know his shows don’t appeal to everyone because the music tends to be not very melodic in the common sense and his lyrics can be rather tricky and a bit hard to follow. But that’s exactly what attracts me to his shows. They are unconventional, very cleverly written and you can’t just sit through them without paying proper attention. Getting the chance to finally see a production of Sweeney Todd on stage had me quite excited with anticipation. The story is transported into the 1950s in this production which works fine. It’s still dark and gloomy and the whole atmosphere is just like it should be – a bit uncomfortable and rather creepy at times. 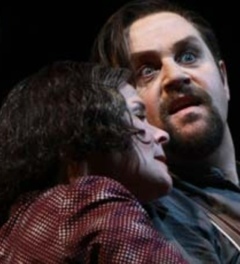 I admit I couldn’t really imagine Michael Ball as Sweeney Todd. But when I’m wrong I will say so and on this occasion I definitely was. Michael’s Sweeney is angry and vengeful with just the right amount of cynicism. I’m no fan of his voice I have to say but that’s just my personal taste. His acting is spot on, maybe a bit too exaggerated at times but that doesn’t take anything away from a superb performance. 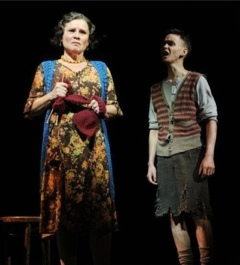 Imelda Staunton as Mrs. Lovett is a true revelation. She’s definitely the star of the show. Her Mrs. Lovett is funny and likeable despite her dark side. It’s easy to understand how torn she is between her love for Sweeney Todd and the understanding of the gruesome events. The whole show is well cast although I did find Lucy May Barker’s Johanna a bit bland. But then that particular character has never been my favourite in the show so it might just be me being biased. Luke Brady is a very handsome and genuine Anthony and he sings one of my favourite songs in the show beautifully. I really liked Peter Polycarpou’s Beadle Bamford. It’s not the most outstanding part but he manages to leave an impression. John Bowe’s Judge Turpin isn’t to my taste I have to say. 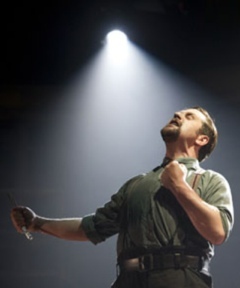 I found his acting to be a bit weak next to such strong performances as Michael Ball’s or Imelda Staunton’s. I understand it must be hard to hold your ground in a cast like this but then Peter Polycarpou manages just fine to name just one example. A special mention goes to Gillian Kirkpatrick as the Beggar Woman. It may look like a small role but when you think about it it’s such a vital part in the storyline. And Gillian Kirkpatrick’s performance is nothing but fantastic. My overall verdict of this show is short and simple: Amazing! Don’t miss out on this! It’s a great production of a fantastic piece of theatre. This is Sondheim at his best and every theatregoer should catch this while it’s playing in town. 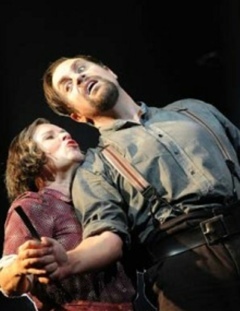 For more info and to book tickets go to http://www.sweeneytoddwestend.com.